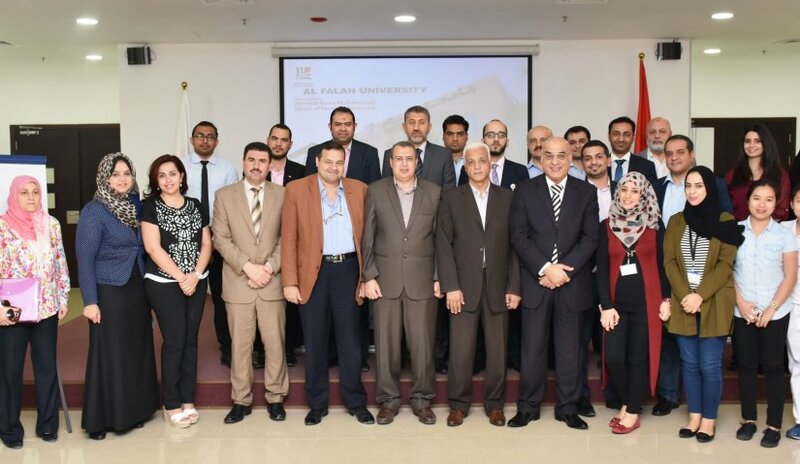 The Deanship of Student Affairs together with Human Resources Unit at Al Falah University organized an interactive meeting for the AFU staff to conclude the activities for the Academic Year 2016-2017. Prof. Nasr Abbas, Dean of Student Affairs Unit, Dr. Khalid Heneidi, Dean of College of Mass Communication, Dr. Mohammed Dessouky, Dean of College of Law, Mr. Ahmed Reza, Head of Human Resources Unit together with faculty members from the different colleges, General Education Department and the administrative staff attended the meeting. Prof. Abbas, Mr. Reza, Dr. Samer Abdulhadi and Mrs. Hibatullah Jawhar from College of Mass Communication spoke to the participants with regards to lying and integrity, work ethics and work excellence, psychological concepts for social life and brain development in language learning. Several members of the administrative staff also presented a series of cultural and historical details of the countries represented by the nationalities of AFU staff. Ms. Yvette Dela Cruz, Executive Management Secretary organized a presentation for the Philippines; Mrs. Maria Sava, Graphic Designer showed a production for Romania and Mrs. Wala’a Mansour, Documentation Officer informed the participants of the facts about Jordan and Palestine. The event aims to strengthen the camaraderie between the members of Al Falah University, to cater to the professional training and development needs of the staff and to prepare for the upcoming academic year.